I will never forget the day I received correspondence from a woman I’d met during a book signing, that email forever changed my Mischief Series. The lady, Beverly Hutton, had been in Barnes and Noble and purchased Mischief in the Mushroom Patch. She spent a few minutes visiting with me and left. I remember specifically asking her if she’d let me know what she thought about my book. It’s important to every author, to know what their audience thinks about their work, and I gave her my card. 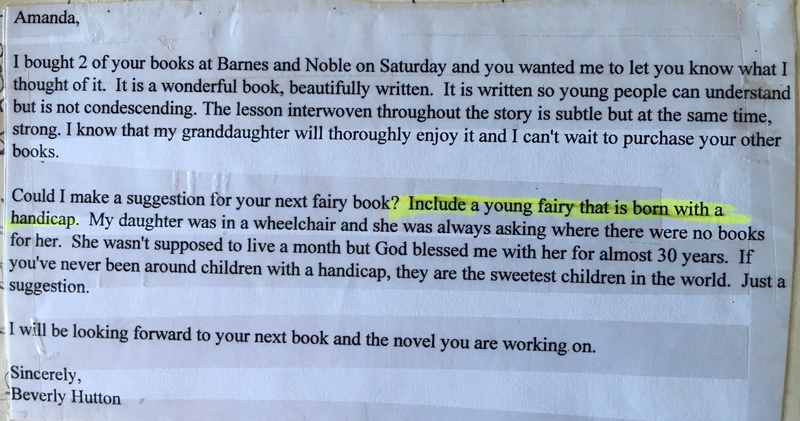 She remembered, and her email came weeks later and it included a suggestion. After reading the mail, as you can imagine, my heart sank at Beverly’s loss. But I was pleased that she complimented my work, and I was inspired by the thought that Jeni would have liked the characters that I had created as well. I thought about Beverly’s suggestion for a long time. 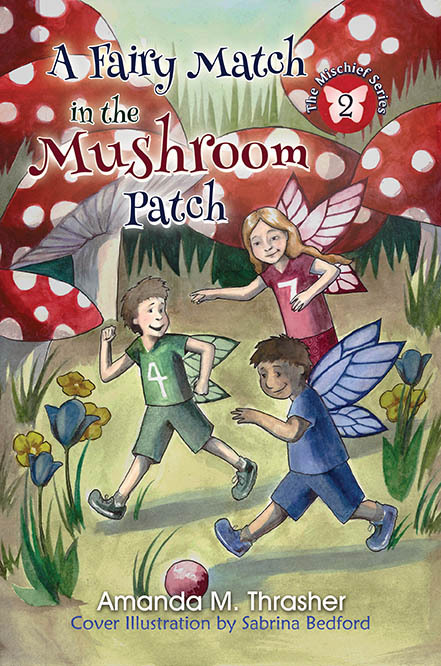 Mischief in the Mushroom Patch was written for my mom, who I loved dearly, and had lost to a terrible illness. Did I dare touch my mom’s book, and could I honor another woman’s daughter. People I’d never met? Still I couldn’t get Beverly’s email off my mind. I thought if I were careful and respectful, I could do this, and set about creating beautiful little Pearle. I carefully wove Pearle into the story, the existing mushroom patch. No official declaration that she was there, it worked. Instead of a wheelchair, I placed her in a chariot. It looked like a chair, but in the story all referred to it as Pearle’s chariot. She didn’t seem to notice she was any different, which delighted Beverly. Pearle constantly has a lovely spirit. Full of life and love. Sweet and kind. Gentle and thoughtful. And she always manages to be helpful and never once does this little fairy ever complain. After Beverly had reviewed the sample chapters, two of them, she loved Pearle as well. I finished the book and officially met Beverly for the first time at Barnes and Noble, the launch of A Fairy Match in the Mushroom Patch. At that time, she purchased several books, and I couldn’t help but ask why. She informed me that Jeni had multiple surgeries at Scottish Rite hospital before she passed and that she was going to donate the books to the children. I ended up going with her, as did my editor and mentor, Anne Dunigan. Between all of us, we took bears in wheelchairs from “Build a Bear,” and books from my publisher at that time, Barnes and Noble, and Beverly’s donations from multiple organizations. 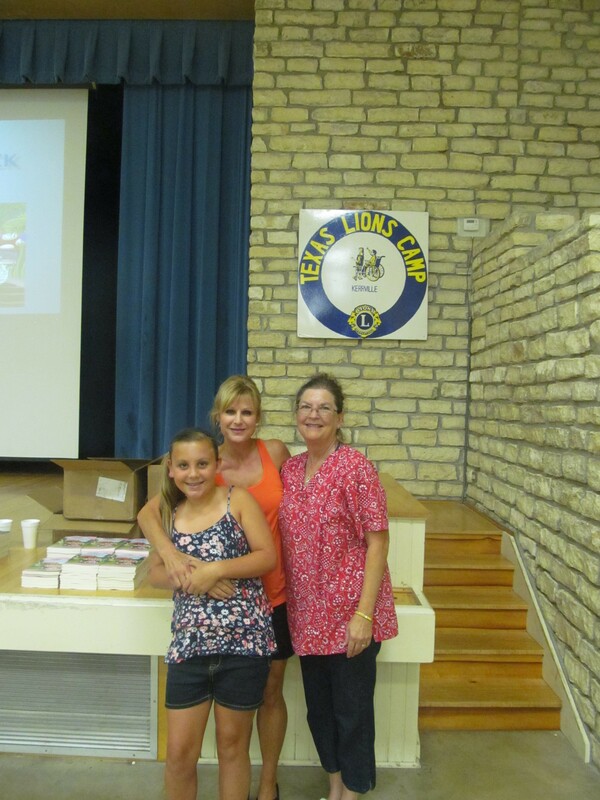 We also went to Jeni’s favorite camp, Texas Lions Camp, Texas Pythian Home, and visited with other children as well. All in the name of little fairy named Pearle, inspired by Jeni. 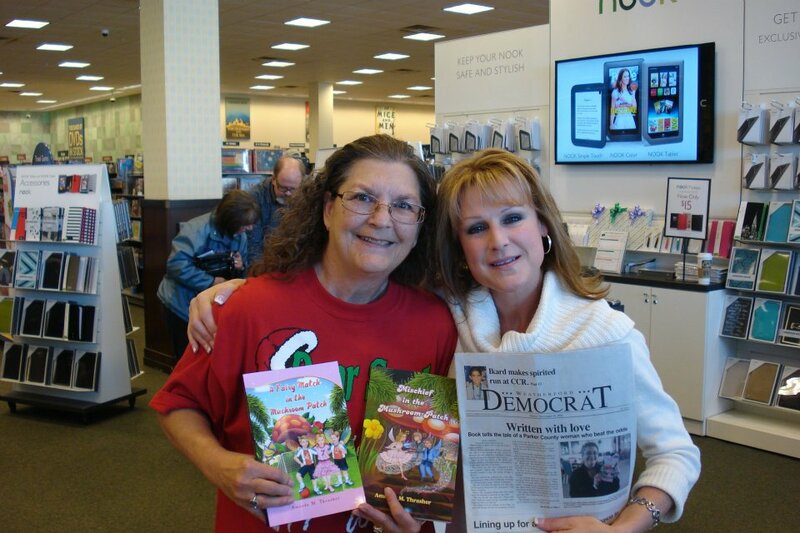 Amanda M. Thrasher and Beverly Hutton at Barnes and Noble. Since then Spider Web Scramble has been released. It took longer than I planned due to other projects that unfortunately I had no control of, but I’m glad it’s finished. I’ve already started four and do not plan for it to take nearly as long. 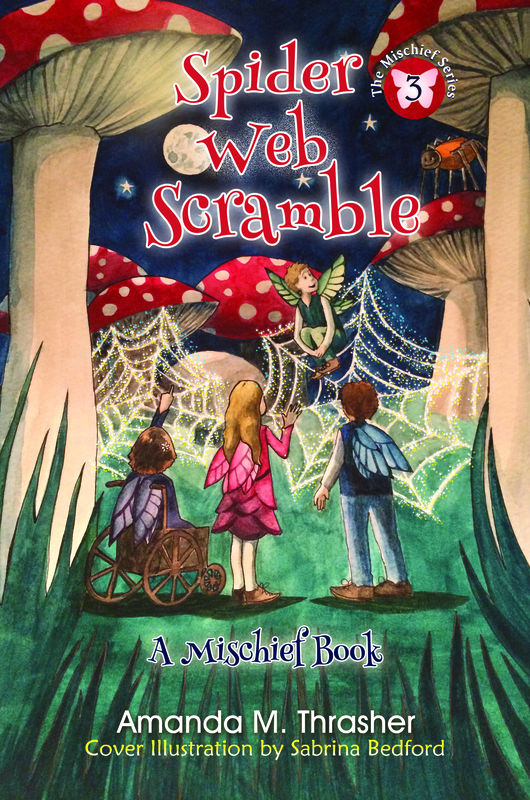 Pearle has a large role in this magical book, Spider Web Scramble. I realized while writing it, her story, creating her, is incredibly unique. Her character, traits, the things I love about her the most, are qualities and things that I believe everyone can learn something from. She inspires all to work together, how? Because she brings out the best in those around her, fairies or not. She encourages others, and always sees the best in things or co-fairlings, as the case may be. Her unwillingness to be selfish is the at the very heart of every lesson the elders in the mushroom patch teach the others. I couldn’t ask for an easier character to write. She’s so sweet in every way, and I can’t imagine my Mischief Series without her. She is a permanent character and will forever remain a part. I stay in contact with Beverly, and there was supposed to be a special piece about the creation of Pearle in this book, Spider Web Scramble. It didn’t make the deadline. But I’ll have it added. I think her story is beautiful and is worth telling. 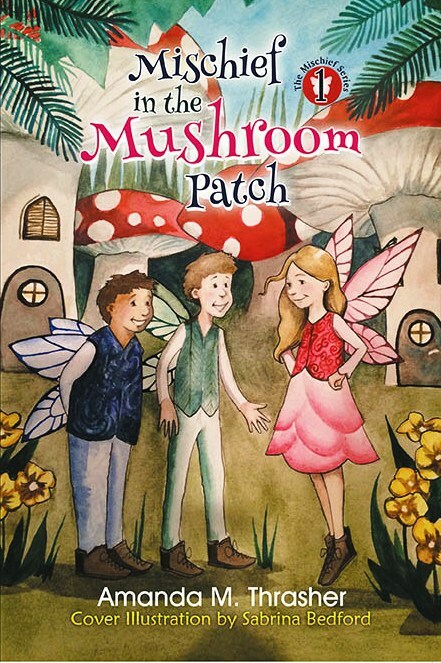 Book 2, A Fairy Match in the Mushroom Patch is dedicated to a girl I never knew, Jeni. I think she would have been pleased with Pearle’s growth, and the lessons she continues to teach us. I know I will never forget the girl I never knew, and her mom, Beverly, holds a special place in my heart as well. I hope when she reads my books she can giggle at times, smile at others, and know in her heart that Jeni would have likely approved. Jeni was only supposed to live a few years, but Beverly was blessed with her for thirty. During that time, Jeni had happy days and struggles. She had many surgeries, but also enjoyed the life that she had. The camp and the hospital among other places we visited, were all attended by Jeni. Texas Lions Camp was her favorite. When you write a story, you never who you’re going to meet, and what amazing things you can do. All work available from author site, the Publisher, Amazon, BarnesandNoble.com and select stores.